Be careful what you wish for because you may just get it (in unexpected ways). One night in October 2015, I released a yellow lantern with my well-wishes into the sky in Bali. One of my messages is for myself. It says, “Love yourself everyday… I wish you find great joy and meaning in your business.” But I didn’t know at that time, it meant going through depression to finally know how to love myself and find meaning in what I do. 2016 was a year of recovery, self-love and peace for me. After overcoming depression last year, I started my Self-Love Project and focus primarily on loving myself this year. So most of the books I read is also related to self-love and understanding myself. This year is also the first time I venture into the “Religion and Spirituality” section of the library. Previously, this genre never interests me. But ever since I read one book by Wayne Dyer, my perception changed and I love this genre very much. I guess it was due to my own direct experience with spiritual awakening and depression, I could easily relate to what is written in these spiritual books. 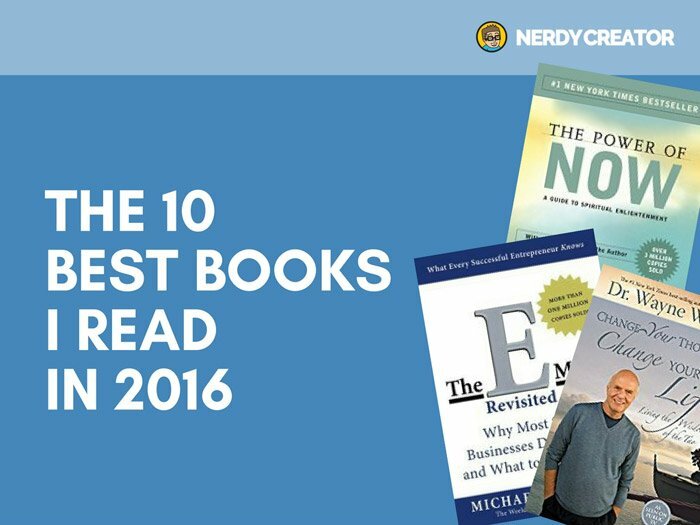 Unlike last year’s list which consists mainly of business and productivity books, there’s no surprise that most of the books on this year’s list are spiritual books. Reading non-fiction is always intriguing. Whether a book benefits you, depends on what stage of life you are in. Spirituality is something you either get it or you don’t. It’s all depends what state you are in. When you are ready and open to accept spirituality into your life, you will find these spiritual books to be extremely beneficial. If not, you may think it’s total trash. I probably won’t understand a thing too if I were to read these books ten years ago. So if you are open enough, below are a few books I highly recommend to you. You can also follow me on Instagram, Goodreads or Facebook to see what I am reading now. In 2016, I read 83 books (81 English, 2 Chinese) in total. This year, I receive a few books from a couple of my friends and I’m grateful for that. But even though I prefer to read hardcopy instead of e-books, I don’t like to keep books in my house. So I usually borrow them from the library instead. As a Singaporean, I’m always grateful that libraries are everywhere here. Most books are readily accessible here and they are free to read. I’m very fortunate to receive a lot of good information and growth just by reading books in the library. One day, I was wondering how about those people who are in less developed countries who aren’t that accessible to education. How could I help them? So I thought it would be a good idea to pay it forward. Starting from this year, I’ve decided to donate a certain amount of money to an education-related charity for each free book I read. This year, I chose to donate US$8.30 (US$0.10 for each free book I read) to educate a child in Cambodia. Hope this small gift will benefit those who want to learn. I read the most books from Wayne Dyer this year, seven in total. I was introduced to this author because one of my friends talked about his death during an entrepreneur incubator program I attended in 2015. It left me a deep impression. Actually, I saw his books in the library many times before, but it never did occur to me to borrow them. The Shift, is the first book I read from him. It speaks to me on a deep level and that led me to read many other spiritual books from him and other authors. But I have this rule to only put one book from the same author in my annual top 10 list, so I decided to recommend Change Your Thoughts, Change Your Life instead. This book is Wayne Dyer’s interpretation of Lao Tze’s Tao Te Ching. You don’t have to be a Taoist to receive wisdom from this book. There’s a lot of insights which can be applied to your daily life that will make your life peaceful, inspired and harmonious. Wayne Dyer also adds action steps which can be taken to apply Lao Tze’s teaching. I still refer to the notes I had taken from time to time to remind myself of peace. This book is recommended to me by someone on Facebook. When I was reading the first couple of chapters, it gave me the chills. What Eckhart Tolle describes from his spiritual awakening is so similar to my own experience. I was also deep in depression before I recognized the voice in my head wasn’t me. This year, I read three books from Eckhart Tolle. I love the other two books too, A New Earth and Stillness Speaks. What I love about Eckhart Tolle’s books is his writing makes it easy for the readers to understand spirituality. He uses examples from our daily life and explain his insights with a lot of clarity. The Power of Now especially, he uses a Q&A format to share his teachings. If you have problems staying in the present and an over-reactive or noisy mind, I highly recommend this book to you. This is a small yet insightful book. The introduction is a little abstract, but once it started talking about the domestication of humans and the four agreements, things really get interesting and relatable. In Don Miguel Ruiz’s book, The Fifth Agreement, he introduce another agreement: Be skeptical, but learn to listen. I love both books from Don, they make a lot of sense and very easy to understand. And they help me understand and resolve some of my self-criticism and unworthiness issues. Even though most books I read this year are spiritual books, I did find one of my favorite business books of all time, The E-Myth Revisited. The E-Myth series is recommended by my business mentor, Roger Hamilton. The funny thing is when I went to my mentor’s incubator program in 2015, we were asked to pick a book to read from the library. The E-Myth Mastery, another book by the same author, was the book I picked from the library! I was meant to read this book! I never got a chance to read the book though when I was in there in Bali because there were simply too much things to do. Plus, I wouldn’t recommend E-Myth Mastery to beginners. It has a lot of details, not something for people who don’t like details. The E-Myth Revisited is much better book for beginners. It provides the overview and much easier to read. This book has changed my whole perspective of doing business. It talks about business in three different perspectives — entrepreneurial, manager and technician perspectives. Most entrepreneurs who start businesses are not real entrepreneurs. They are technicians, which means they are skilled in what they do and love what they do, but they have no idea how to do business. They are working in their business instead of working on their business. So instead of creating a business, they create a monster. One that depends all on the business owner to survive. This is a book I highly recommend to anyone who wants to start a business and loves systems. Apart from spiritual books, this year I’m also very interested in personality books. Please Understand Me II, is a book published in 1998. The first book, Please Understand Me, is a book published in 1978. I read both of them. At the beginning of the year, I was searching for information online about my MBTI type and someone from YouTube recommend this book, so I checked them out. If you know about MBTI and want to delve deeper into the topic, you can read these two books. These two books are unlike what you read online about MBTI. They grouped the 16 MBTI profiles into four meaningful temperament and talk about each temperament as a whole. This book is suitable if you want to know more about your personality and how your mind prefers to operate. It’s also a good book for understanding other people and their differences. Every year, there is always one book which I felt could be more popular than it was, I Am is that book this year. This book grabs my attention right from the start, especially when he mentions he went to the library and started reading everything about spirituality. He understood everything which are shared in the book. I have the same experience as him. Previously, I didn’t know anything about spirituality and one day, I was awakened and I saw everything in new light. This book is profound and it helps me to understand the true meaning of peace and happiness. Peace is balanced and neutral. Positive states of mind, even though is perceived as desirable, is not that different from negative states of mind. There’s an imbalance of energy in both of the states. If you want to have a better understanding of your spiritual self, read this book. This year, I read six books from Buddhist teacher, Thich Nhat Hanh. The author has written many books on mindfulness for every situation possible such as working, eating, sitting and walking. Even though the breathing practice in all the books are similar, but I can’t help but feel calm every time I read his books. I pick the book, Peace Is Every Breath, to be on the list because it’s a book for our busy lives. This book encourages us to focus our attention on all the small little things we do from the time we wake up. For example, turning on the tap and brushing our teeth. The book also tells us not to rush through our day and let our mind run off into future. If you led a busy life and want to slow down, this is the book which will bring you peace. The Alchemist is a book given by my friend from Philippines. Not long after, another friend of mine wanted to give me the same book. I guess I was meant to read this book this year. A special 25th anniversary edition of this international bestseller was recently published in 2015. If you love to read stories and fables which are mystical and get you reflecting, this is the book for you. The Alchemist, is a tale about self-discovery. It gets you thinking about your life and what you have always wanted to accomplish. In the book, this is called “Personal Legend”. One of my favorite quote in the book is, “The secret of happiness is to see all the marvels of the world, and never to forget the drops of oil on the spoon.” When we are too focused on the oil on the spoon as we wander around, we lose sights of the scenery around us. But when we focus on the scenery as we wander around, we spill the oil. Balance is key. Profound statements like this in the book will keep you glue to the book. I finished reading this book within 2-3 days. But you don’t have to finish this book so fast. You can stop and ponder upon the deep messages within the book. This is the type of book which is suitable to read more than once at different stage of your life. My Stroke of Insights, is a memoir about a brain scientist who experienced a massive stroke in the left hemisphere of her brain. With this brain injury, Jill couldn’t speak, write, walk or read anymore. However, after shutting down her logical, noisy left brain, she found complete peace and well-being. I love this book because it is inspiring and intriguing. Especially, in the beginning, when Jill accounts how she alternated between her right brain and deteriorating left brain to seek help. The book also teaches us in any moment, we can shift our attention from our left brain to our right brain to feel the peace and stop our “brain chatter”. I don’t remember where I know this book from. It might be from one of Oprah’s videos or Ted Talk. But this book left a deep impression in me. Not just because of its beautiful story, I had a small incident with it. One day in the library, I happened to see this book on one of the shelves, so I borrowed it immediately. I wasn’t aware how bad the condition the book was until I returned it and was informed by the librarians that the book wasn’t fit for circulation anymore. The book label was damaged and the pages had stains and the book looked as though it was soaked in water before. I did notice these defects, but I was so engrossed in the book that I didn’t care about them. Luckily, the librarians let me off this time round. I first knew about this book from its book trailers. The book trailers highlight the stories in the book. One of my favorite trailers is when the author talks about his bad cookies habit which he couldn’t kick and his experimentations with it. This book is about how habit works. The author says that every habit starts with a cue. The cue then triggers a certain routine and when the routine is performed, you feel rewarded. I love this book because the author uses a lot of interesting stories to illustrate his point. And it’s not just individual habits he’s talking about. In his book, he also shares how companies such as Starbuck and Target uses habits to achieve their objectives. One of my favorite examples is when he explains how the song, “Hey Ya!” by OutKast, became popular by leveraging on the listeners’ listening habits. If you want to have more success in life, read this book. The author believes that understanding how habits work and changing your habits would help you achieve your objectives. This year, I had written two books and published one. The other one I set aside for now until I have enough money to hire an editor. Hope to write and publish more in 2017. What if depression is a gift and not suffering? This is a memoir about my experience with depression and how it helped me understand my own emotions. It’s also about opening up and feeling vulnerable. In the end, my perception towards depression changes. When I was no longer resisting and fighting against it, it became a gift to me and led me to learn more about self-love and spirituality. Plus, all the great books I read above. Most people confuse depression with being sad or negative. If you have friends with depression or suffer depression yourself, this book will help you understand more about depression. Even if you don’t have depression, this book will help you understand emotions in general and see where you have been suppressing your emotions.